Easily make quizzes and tests that delight using ProProfs Quiz Maker. 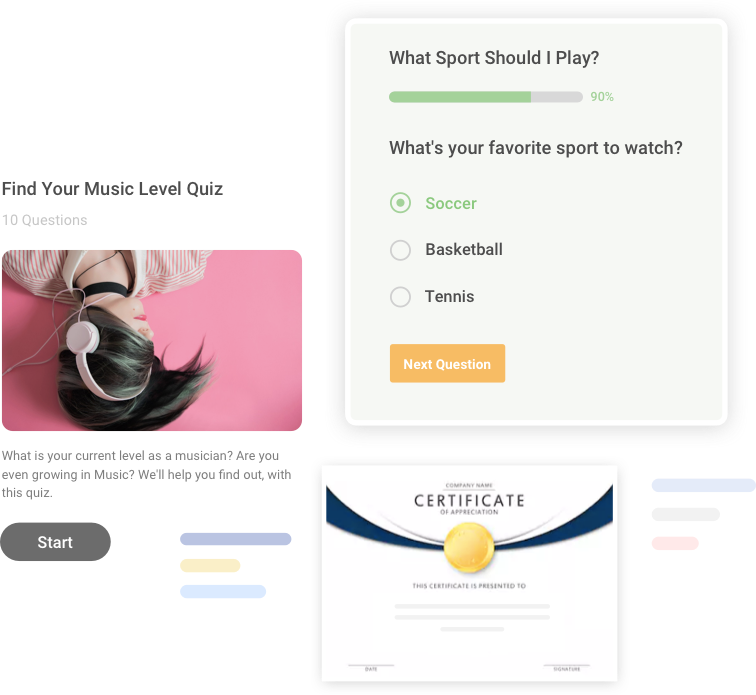 Create a quiz from scratch or use the ProProfs library having 100k+ customizable quizzes and 1,000,000+ ready to use questions. 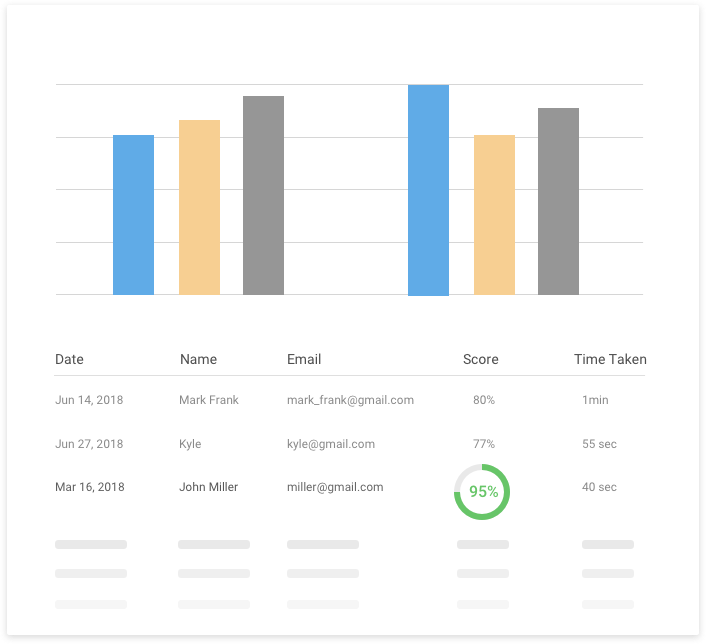 Create scored quizzes, personality quizzes or surveys by selecting from 15+ question types. Add images, presentations and videos to your quiz. Quizzes work great on every device including desktops, laptops and mobiles. Once the quiz is published, you can easily share the quiz via email, embed on your website and blog or even share with private groups with each user having their own login credentials. You can also create quizzes in 70+ languages. Get useful insights with advanced reports and analytics. Check out quiz results to get details like who took your quiz and when, their scores, performance and more. Review stats like question difficulty level to understand where you learners are struggling. Save time by automating quiz grading and delight quiz takers with instant results & feedback. Quiz software helps you explore 100+ settings and smart configurations that let you customize your experience with features like security levels, roles & permissions, notifications, compliance and can also be used with Tin Can & SCORM Compliant LMS. Create premium quizzes, set a price and sell online. We support multiple authentication methods (Single Sign On, User Management Console & more), APIs and many advanced integrations including SalesForce, MailChimp, HubSpot, Infusionsoft and many more. Create secure exams, add instructions, schedule tests and prevent cheating. Create tests to train and assess employees. Get administrative controls and delightful reports. Create secure quizzes, manage classes & receive advance performance reports of learners. Create fun personality quizzes and share with your friends using Email, Twitter or Facebook. Create stunning polls to gather opinions & feedback. Drive traffic & prevent voting fraud. Create branded surveys to gather customer feedback or conduct market research. ProProfs has been a great tool for training hundreds of employees who are spread out across the US and Canada. It has allowed us to provide over 3,000 sessions so far. Our learners take the training as per their convenience, from anywhere they can access the internet. I have to say I'm quite impressed. ProProfs is a winner for quizzes. I've just added it to my page on Best Ways To Create Online Tests. ProProfs Offers Powerful Database Capabilities!